Make El Hierro one of your ‘must see’ destinations this year. An island full of rural hotels and apartments, and even boasting the smallest hotel in the world. You can reach El Hierro with a flight from a neighbouring Canary Island or by ferry from Los Cristianos in Tenerife. With a warm year-round climate, a holiday in El Hierro is for those who want to get away from it all and enjoy the peace and quiet this island has to offer. El Hierro is the smallest of the Canary Islands, and the furthest west. Consequently it is the last place in Spain where the sun sets. 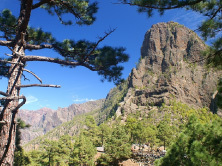 Superb pine forests, sheer mountain walls, unusual fauna and flora, and fantastic outlook points (miradors) all form part of your El Hierro holiday and are part of the island’s appeal. We’ve done the searching for you, and selected 3 fantastic hotel deals in El Hierro. These are for accommodation-only, so you can either book flights independently or we are happy to put together flight inclusive deals for you from your local airport. Just let us know. Many customers ask us for all-inclusive hotel in El Hierro, but unfortunately El Hierro does not offer this type of holiday. from £495 pppw in a Double/Twin – Half Board – 3 Star- flights are available at a supplement. Room only, bed & breakfast, full board are also available. 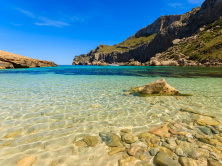 from £269 pppw in a Double/Twin – B&B – 3 Star – flights are available at a supplement. Room only, half board, full board are also available. from £232 pppw in a Double/Twin – B&B – 2 Star – flights are available at a supplement. Room only is also available. There are a few restaurants on this small island – the speciality being seafood and stews. Dishes include potaje – a legume-based stew, puchero – meat stew, and rancho con papas – meat with potatoes.Fish can be fried, stewed or grilled and the typical garnish is papas arrugadas – wrinkled potatoes boiled in salty water and sauces are mojo rojo and mojo verde prepared with vinegar, oil, garlic, salt and spices.Quesadillas are cheese-based desserts. The local cheese has become an important export as well as the wine produced in El Golfo [which has a high alcohol content]. There are 35 beaches on the island of El Hierro, with the best located on the east facing coast. 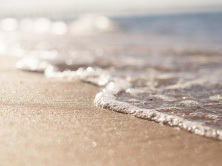 The longest beach, more than 3km in length, is the stretch of sand including the Playas Almorranas, Playecillas, Arena, the Playa de los Cardones and the Playa de las Calcosas, fronting the Parador de El Hierro. More and more people are seeking all inclusive holiday packages, and El Hierro is no exception. However, it’s just not an island that offers all inclusive. You will mainly find self-catering accommodation, but you can also find bed and breakfast, half board, and even full board occasionally. The weather in El Hierro tends to be fairly constant. With an average temperature of 20ºC throughout the year (average high of 22ºC and low of 18ºC), El Hierro does make an excellent holiday destination, particularly as there is a 60% chance of having a sunny day. From the UK, you cannot fly direct to El Hierro. 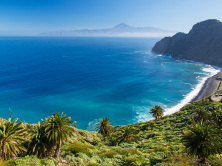 You will need to fly into either Tenerife, Gran Canaria, Lanzarote or Fuerteventura and then take an internal flight via Binter Canarias on to El Hierro. From Gran Canaria (LPA), you can then fly direct to El Hierro (VDE). Flights occur just once a day direct, or you can take one of the numerous daily flights via Tenerife North (TFN). From La Palma (SPC), you will need to fly either via Tenerife North (TFN), or Gran Canaria (LPA). There are numerous flight every day. 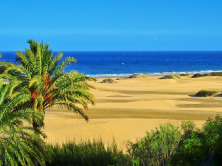 From Fuerteventura (FUE) there are no direct flights, therefore you will need to fly via Tenerife North (TFN), or Gran Canaria (LPA). Again, there are numerous flights a day via both airports. From La Gomera (GMZ), you can only get to El Hierro via Tenerife North (TFN), but there is only 1 flight a day. From Lanzarote (ACE), there are numerous flights every day via both Gran Canaria (LPA) or Tenerife North (TFN). If you arrive into Tenerife South (TFS), you can only get to El Hierro if you fly via Gran Canaria (LPA) but there is only 1 flight a day and as you can see from the table below, this takes around 5 hours. 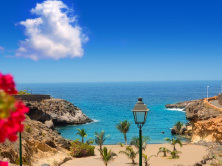 Flights from Tenerife North (TFN) can either by direct to El Hierro (there are 4 flights a day), or via Gran Canaria when there is just 1 flight a day. Of course, you can make the most of the indirect flights by taking a 2 centre holiday. However, if you are travelling straight through, you will need to take note of the internal flight times and tie them into your flight from/to the UK. 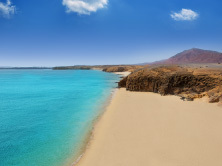 Internal flights can either by booked via us, or direct with Binter Canarias. The absence of sandy beaches means El Hierro has escaped the holiday tourist invasions experienced by other islands. Instead it has caught the attention of naturalists. Rural tourism on El Hierro comes into its own, with a carefully managed network of hotels and accommodation. It even has the strange little Punta Grande stone hotel that is the complete opposite of luxurious! It has no amenities to speak of, and sits dangerously close to the waves which often come up over the rocks and hit the sides of the hotel itself. There are ample opportunities for activities on El Hierro holidays. Hiking enables visitors to appreciate the wonderful landscapes shaped by spectacular lava spills, volcanic cones, green pine forests and laurisilva woods. The cliffs that rise up out of the transparent waters surrounding El Hierro are famous for their excellent sea bed conditions, making these waters ideal for scuba-diving; in fact El Hierro attracts some of the most acclaimed underwater photographers, who come to capture on film the huge diversity of marine species in the crystal clear waters. A great natural feature of an El Hierro holiday is the bay of El Golfo. Some believe this to be the rim of a large crater, half of which is sunken and the other rising theatrically to over 1000m. The people of the island of El Hierro are the descendants of the ancient Bimbache tribes, who worshipped the sacred Garoe evergreen tree, which produced water from its leaves. For thousands of years, until Columbus proved otherwise, El Hierro was considered the end of the world – this was the last piece of land which Columbus was to see until he landed in the Bahamas in 1492. In the Old World, El Hierro was considered finis terrae, Meridian Zero passed through Orchilla until astronomers in the 19th century fixed this point in Greenwich, London. 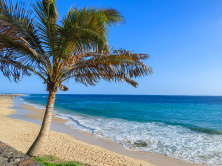 Frontera – Located on the west coast of El Hierro, Frontera is a very fertile area and famous for its agricultural produce including banana plantations, fig trees, pineapples and vines. Valverde – The capital of El Hierro, Valverde is also known as Santa Maria de Valverde and is a pretty town with easy access to the top Tamaduste and La Caleta.